Artist Eric Mesplé emerges at Guy Hepner with an impressive collection that is especially striking considering the unique methods he uses to create them. Bridging his foundations in archeology and metalwork, the Mesplé uses his skills in technology and engineering along with his knowledge of magnetics an kinetics to establish highly skilled sculptures. 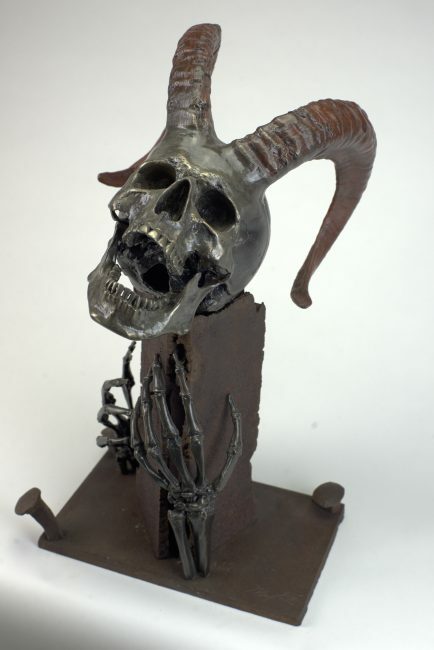 The exhibition includes an array of anatomically correct sculptures made of bronze, steel, ferric silver nitrate and concrete. In his piece, Dominion, Mesplé combines bones from human form with that of an animal, bringing to life a new hybrid creature frozen in an exotic twist between the afterlife and everlasting struggle. Casted in bronze, bone by bone, the artist emulates an etherial creature taking over the human form. Dominion is one of Mesplé’s early creations of 2015, produced by a technique using advanced lost-wax or precision casting, a method that dates back to the Chalcolithic period (4500–3500 BCE). 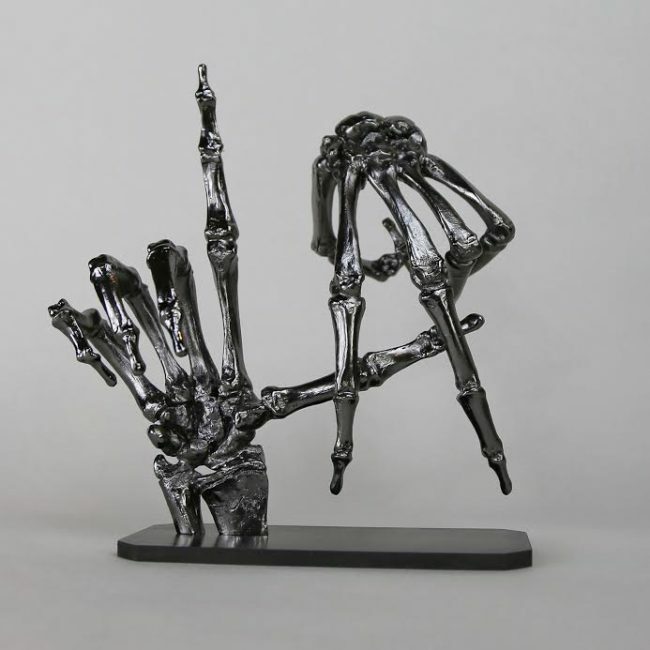 Mesplé ‘s, To Live and Die in LA sculpture definitively portrays the popular symbol for the beloved city. Mesplé captures the absolute culture of Los Angeles in this limited edition piece produced in black chrome and ferric silver nitrate. His focus is not to display the complexity behind his creations, but rather evoke a simple, even minimalist form that fascinates and emphasizes his aesthetic. 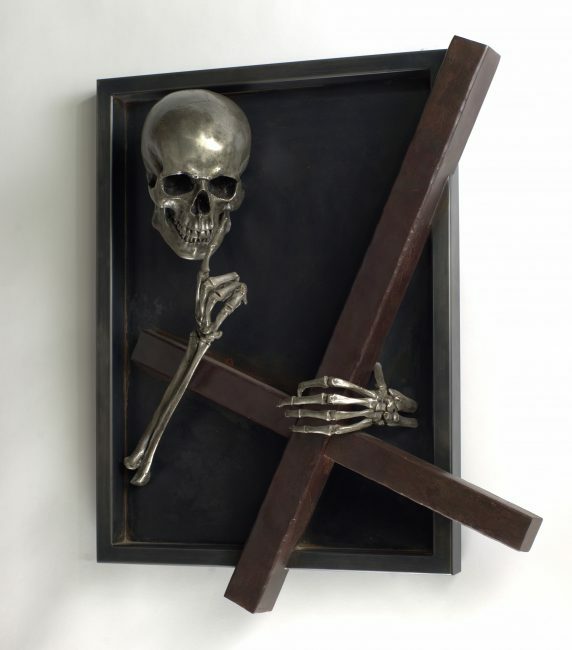 His methodology supersedes his years, and is reflected in the immaculate works brought to life by his expert hand through intense and often ironic imagery. In addition to his museum quality art, Mesplé has been sought out for projects in the medical, energy, transportation and military fields. He has worked on countless product development and installation productions. Clients include Google, Red Bull, MGM Grand Hotel and Casino, Chipotle Restaurants, Goldieblox, Nokia, Microsoft, the U.S. Military, Lincoln Park Zoo, Denver International Airport, Chapman University, University of Chicago and more. Mesplé was notably tapped to be the lead in the restoration of The White House Sculpture Collection sculpting, casting and assembling prehistoric mammals for the Smithsonian Museum. Guy Hepner Contemporary Art gallery in New York is pleased to present the artist Mesplé sculpture, bronze, steel metal art work for sale. Inquire on prices to buy Mesplé art.